Bust of Thucydides, historian who recorded the Plague of Athens, and who himself was afflicted and survived. The Plague of Athens was a devastating epidemic that ravaged the city-state of Athens in ancient Greece in 430 B.C.E., during the second year of the Peloponnesian War (431-404 B.C.E. ), when an Athenian victory still seemed within reach. The disease killed over 30,000 citizens, sailors, and soldiers of Athens—one-quarter to one-third of the Athenian population—including the influential statesman, general, and ruler Pericles. The city-state of Sparta, and much of the eastern Mediterranean, was also struck by the disease. The plague returned twice more, in 429 B.C.E. and in the winter of 427-426 B.C.E. Traditionally considered an outbreak of the bubonic plague, the symptoms and epidemiology, as well as DNA studies of corpses, have led scholars to advance alternative explanations, notably typhus and typhoid fever, as well as smallpox, measles, toxic shock syndrome, anthrax, and even ebola or a related viral hemorrhagic fever. Modern historians disagree on whether the plague was a critical factor in the loss of the Peloponnesian War. However, it is generally agreed that the loss of this war may have paved the way for the success of the Macedonians and, ultimately, the Romans. Accounts show a number of immediate social consequences of the epidemic, including a decline in social mores, with people acting less dishonorably in circumstances where many did not expect to live long enough to enjoy a good reputation for their behavior. (See social implications below). At the time the plague struck, Athens was the strongest city-state in Greece, but was engaged in the early stages of a major military conflict, the Peloponnesian War (431–404 B.C.E.). Athens and its empire was waging this war against the Peloponnesian League, led by Sparta. Sparta and her allies, with the exception of Corinth, were almost exclusively land based powers, able to summon large land armies, which were very nearly unbeatable. Under the direction of their leader Pericles, the Athenians retreated behind the city walls of Athens. They hoped to keep the Spartans at bay while the superior Athenian navy harassed Spartan troop transports and cut off supply lines. Unfortunately, the strategy also resulted in adding many people from the countryside to an already well populated city. In addition, people from parts of Athens lying outside the city wall moved into the more protected central area. As a result, Athens became a breeding ground for disease. In his History of the Peloponnesian War, Thucydides, the contemporary historian, described the coming of an epidemic disease that began in Ethiopia, passed through Egypt and Libya, and then to the Greek world. It is believed to have entered Athens through Piraeus, the city's port and sole source of food and supplies. Striking in 430 B.C.E., this plague ravaged the densely packed city, wiping out roughly one-quarter to perhaps one-third of the people sheltered within Athens' walls. Dead were over 30,000 citizens, sailors, and soldiers. The disease killed many of Athens's infantry, some expert seamen, and their statesman and general Pericles, who died during one of the secondary outbreaks in 429 B.C.E. Pericles (c. 495 – 429 B.C.E.) was the renowned Athenian leader who turned the Delian League into an Athenian empire and led his countrymen during the first two years of the Peloponnesian War. 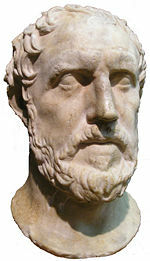 Prior to this death, Pericles was forced to defend his actions, when the city's plight, caused by the epidemic, triggered a wave of public uproar. He did this in an emotional final speech, a rendition of which is presented by Thucydides. Pericles also witnessed the death of both his legitimate sons from his first wife, and his sons Paralus and Xanthippus, in the epidemic. He died of the plague in the autumn of 429 B.C.E. As a result of the plague, Athenian manpower was drastically reduced and even foreign mercenaries refused to hire themselves out to a city riddled with plague. The sight of the burning funeral pyres of Athens caused the Spartan army to withdraw for fear of the disease. The fear of plague was so widespread that the Spartan invasion of Attica was abandoned, their troops being unwilling to risk contact with the diseased enemy. After the death of Pericles, Athens was led by a succession of incompetent or weak leaders. According to Thucydides, it was not until 415 B.C.E. that the Athenian population had recovered sufficiently to mount the disastrous Sicilian Expedition. "As a rule, however, there was no ostensible cause; but people in good health were all of a sudden attacked by violent heats in the head, and redness and inflammation in the eyes, the inward parts, such as the throat or tongue, becoming bloody and emitting an unnatural and fetid breath." "These symptoms were followed by sneezing and hoarseness, after which the pain soon reached the chest, and produced a hard cough. When it fixed in the stomach, it upset it; and discharges of bile of every kind named by physicians ensued, accompanied by very great distress." "In most cases also an ineffectual retching followed, producing violent spasms, which in some cases ceased soon after, in others much later." "Externally the body was not very hot to the touch, nor pale in its appearance, but reddish, livid, and breaking out into small pustules and ulcers. But internally it burned so that the patient could not bear to have on him clothing or linen even of the very lightest description; or indeed to be otherwise than stark naked. What they would have liked best would have been to throw themselves into cold water; as indeed was done by some of the neglected sick, who plunged into the rain-tanks in their agonies of unquenchable thirst; though it made no difference whether they drank little or much." "Besides this, the miserable feeling of not being able to rest or sleep never ceased to torment them. The body meanwhile did not waste away so long as the distemper was at its height, but held out to a marvel against its ravages; so that when they succumbed, as in most cases, on the seventh or eighth day to the internal inflammation, they had still some strength in them. But if they passed this stage, and the disease descended further into the bowels, inducing a violent ulceration there accompanied by severe diarrhea, this brought on a weakness which was generally fatal." "For the disorder first settled in the head, ran its course from thence through the whole of the body, and even where it did not prove mortal, it still left its mark on the extremities; for it settled in the privy parts, the fingers and the toes, and many escaped with the loss of these, some too with that of their eyes. Others again were seized with an entire loss of memory on their first recovery, and did not know either themselves or their friends." Historians have long tried to identify the disease behind the Plague of Athens. The disease has traditionally been considered an outbreak of the bubonic plague in its many forms, but re-considerations of the reported symptoms and epidemiology have led scholars to advance alternative explanations. These include typhus, smallpox, measles, and toxic shock syndrome. Others have suggested anthrax, tramped up from the soil by the thousands of stressed refugees or concentrated livestock held within the walls. Based upon descriptive comparisons with recent outbreaks in Africa, ebola or a related viral hemorrhagic fever has also been considered. Given the possibility that symptoms of a known disease may have mutated over time, or that the plague was caused by a disease that no longer exists, the exact nature of the Athenian plague may never be known. In addition, crowding caused by the influx of refugees into the city led to inadequate food and water supplies and an increase in insects, lice, rats, and waste. These conditions would have encouraged more than one epidemic disease during the outbreak. However, the use of more modern science is revealing clues. In January 1999, the University of Maryland devoted their fifth annual medical conference, dedicated to notorious case histories, to the Plague of Athens. They concluded that disease that killed the Greeks and their military and political leader, Pericles, was typhus. "Epidemic typhus fever is the best explanation," said Dr. David Durack, consulting professor of medicine at Duke University. "It hits hardest in times of war and privation, it has about 20 percent mortality, it kills the victim after about seven days, and it sometimes causes a striking complication: gangrene of the tips of the fingers and toes. The Plague of Athens had all these features" (UMMC 1999). In typhus cases, progressive dehydration, debilitation, and cardiovascular collapse ultimately cause the patient's death. This medical opinion is supported by the opinion of A. W. Gomme, an important researcher and interpreter of Thucydides' history, who also believed typhus was the cause of the epidemic. This view is expressed in his monumental work "Historic Comments on Thucydides," completed after Gomme's death by A. Andrewes and K. J. Dover. Angelos Vlachos (Άγγελος Βλάχος), a member of the Academy of Athens and a diplomat, in his "Remarks on Thoucydides" (in Greek: Παρατηρήσεις στο Θουκυδίδη, 1992, Volume I, pages 177-178) acknowledges and supports Gomme's opinion: "Today, according to Gomme, it is generally acceptable that it was typhus" ("Σήμερα, όπως γράφει ο Gomme, έχει γίνει από όλους παραδεκτό ότι ήταν τύφος"). in some cases, a rash of flat, rose-colored spots called "rose spots"
extreme symptoms such as intestinal perforation or hemorrhage, delusions and confusion are also possible. Other scientists have disputed the findings, citing serious methodological flaws in the dental pulp-derived DNA study. In addition, as the disease is most commonly transmitted through poor hygiene habits and public sanitation conditions, it is an unlikely cause of a widespread plague, which Thucydides reported as emerging in Africa and moving into the Greek city states. Accounts of the Athenian plague graphically describe the social consequences of an epidemic. Thucydides' account clearly details the complete disappearance of social mores during the time of the plague. The impact of disease on social and religious behavior was also documented during the worldwide pandemic best known as the black death. Thucydides stated that people ceased fearing the law since they felt they were already living under a death sentence. Likewise people started spending money indiscriminately. Many felt they would not live long enough to enjoy the fruits of wise investment, while some of the poor unexpectedly became wealthy by inheriting the property of their relatives. It is also recorded that people refused to behave honorably because most did not expect to live long enough to enjoy a good reputation for it. The plague changed the role of women in Athenian society. The women were temporarily liberated from the strict bounds of Athenian custom. The plague forced Athens to appoint a magistrate called gynaikonomos to control the behavior of women. Another reason for the lack of honorable behavior was the sheer contagiousness of the illness. Those who tended to the ill were most vulnerable to catching the disease. This meant that many people died alone because no one was willing to risk caring for them. Especially poignant are descriptions of how people were not cared for due to the overwhelming numbers of sick and dying. People were simply left to die in buildings or on the streets, and the dead were heaped on top of each other, left to rot or shoved into mass graves. There were cases where those carrying the dead would come across an already burning funeral pyre. They would dump a new body on it and walk away. Others appropriated prepared pyres so as to have enough fuel to cremate their own dead. Those lucky enough to survive the plague developed an immunity, and so became the main caretakers of those who later fell ill.
A mass grave and nearly 1,000 tombs, dated to between 430 and 426 B.C.E., have been found just outside Athens' ancient Kerameikos cemetery. The mass grave was bordered by a low wall that seems to have protected the cemetery from a wetland. Excavated during 1994-95, the shaft shaped grave may have contained a total of 240 individuals, at least ten of them children. Skeletons in the graves were randomly placed with no layers of soil between them. Excavator Efi Baziotopoulou-Valavani, of the Third Ephoreia (Directorate) of Antiquities, reported that "[t]he mass grave did not have a monumental character. The offerings we found consisted of common, even cheap, burial vessels; black-finished ones, some small red-figured, as well as white lekythoi (oil flasks) of the second half of the fifth century B.C.E. The bodies were placed in the pit within a day or two. These [factors] point to a mass burial in a state of panic, quite possibly due to a plague" (Axarlis 1998). The plague also caused religious strife. Since the disease struck the virtuous and sinful alike, people felt abandoned by the gods and refused to worship them. The temples themselves were sites of great misery, as refugees from the Athenian countryside had been forced to find accommodation in the temples. Soon the sacred buildings were filled with the dead and dying. The Athenians pointed to the plague as evidence that the gods favored Sparta and this was supported by an oracle that said that Apollo himself (the god of disease and medicine) would fight for Sparta if they fought with all their might. An earlier oracle had stated that "War with the Dorians [Spartans] comes and at the same time death." Thucydides was skeptical of these conclusions and believed that people were simply being superstitious. He relied upon the prevailing medical theory of the day, Hippocratic theory, and strove to gather evidence through direct observation. He noted that birds and animals that ate plague-infested carcasses died as a result, leading him to conclude that the disease had a natural rather than supernatural cause. Axarlis, N. 1998. Plague victims found: Mass burial in Athens Archaeology April 15, 1998. Retrieved September 16, 2008. Biello, D. 2006. Ancient Athenian plague proves to be typhoid Science News January 25, 2006. Retrieved October 8, 2007. Finley, M. I. 1977. The Greek Historians: The Essence of Herodotus, Thucydides, Xenophon, Polybius. Harmondsworth, Eng: Penguin Books. ISBN 014015065X. Gomme, A. W., A. Andrewes, and K. J. Dover. 1981. A Historical Commentary on Thucydides. Vol. 5, Book 8. Oxford: Clarendon. ISBN 019814198X. McNeill, W. H. 1976. Plagues and People. New York: Anchor Books. ISBN 0385121229. Papagrigorakis, M. J., C. Yapijakis, P. N. Synodinos, and E. Baziotopoulou-Valavani. 2006. DNA examination of ancient dental pulp incriminates typhoid fever as a probable cause of the Plague of Athens. International Journal of Infectious Diseases 10: 206-214. Pomeroy, S. B. 2002. Spartan Women Oxford: Oxford University Press. ISBN 0195130677. University of Maryland Medical Center (UMMC). 1999. Plague of Athens: Another medical mystery solved at University of Maryland University of Maryland. Retrieved September 16, 2008. Zinsser, H. 1996. Rats, Lice, and History: Being a Study in Biography, Which, After Twelve Preliminary Chapters Indispensable for the Preparation of the Lay Reader, Deals With the Life History of Typhus Fever. New York, NY: Black Dog & Leventhal Publishers. ISBN 1884822479. History of "Plague of Athens"
This page was last modified on 22 September 2008, at 22:53.